Nova Scotia beef tenderloin and oyster roulade, spicy tomato , watercress, sturgeon caviar, creme fraiche, chives. 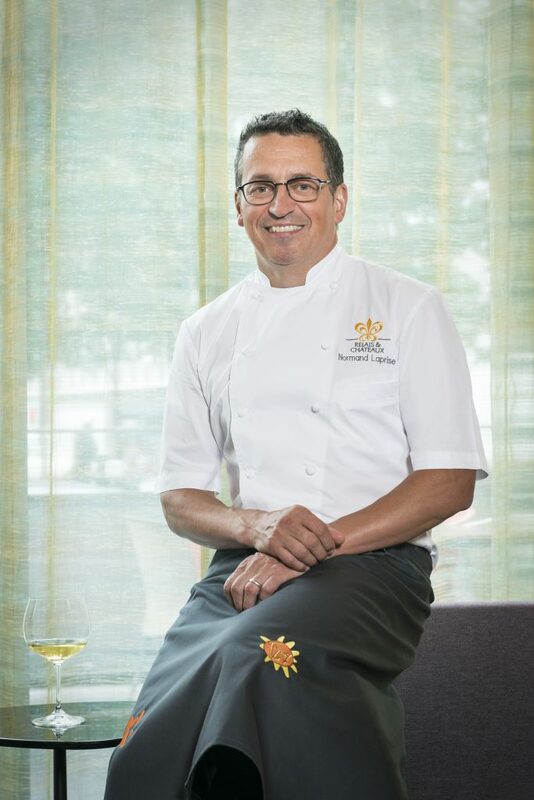 Normand Laprise, Grand Chef Relais & Châteaux – TOQUÉ!, BRASSERIE T! Normand Laprise was born in 1961 in Kamouraska, a small Québec village on the South shore of the St. Lawrence River. His life on the farm followed the rhythm of the seasons and at an early age he developed his taste for products of absolute freshness. In 1978 Laprise enrolled at the Charlesbourg Hotel School in Québec City. His first apprenticeship begins at the Relais & Château La Cloche d’Or in Dijon where chef Jean-Pierre Billoux teaches him masterful skills, rigorous techniques and work with products of absolute quality. He brings back in his suitcase this savoir-faire and in 1989 he is hired as chef de cuisine at restaurant Citrus where he is very quickly noticed for his creativity. In 1993 he opens with his associate Christine Lamarche Restaurant TOQUÉ! on St. Denis street in the heart of “Le Plateau” in Montreal. In 2004 Toqué! takes a leap to the International Quarter at the gate of Old Montreal. A spectacular space is inaugurated at the Place Jean-Paul Riopelle where culinary art and street art live in perfect harmony. In June 2010 Normand opens a second restaurant in the heart of Quartier des Spectacles of Montreal, BRASSERIE T! Normand Laprise shares his time between his restaurant in Montreal and many capitals in the world of international gastronomy – Tokyo, Bangkok, Hong Kong, Paris, Copenhague, Sao Paulo, Cancun and others. Throughout the years, he has hosted big names like Anne-Sophie Pic, Tetsuya Wakuda, Xavier Pellicer, Daniel Boulud, Massimo Bottura, Mauro Colagreco, Luis Andoni and Michel Rostang. He has received the Order of Canada and Order of Québec for his culinary work. John has made several television appearances including, Food Network’s At the Table With, he was also a guest judge on the first season of Top Chef Canada and one of the judges of Food Network’s Chopped Canada. He has a long list of accolades, and was recently awarded the Glenfiddich Award for Chef of the Year by Trillium Chefs Canada and the Gold Award for Educator by the Ontario Hostelry Institute (OHI). In this era of celebrity chefs, he reminds his students that being a chef is hard work that requires passion and dedication. Steve Wall’s passion for food began at the young age of 16 in his home town Happy Valley Goose Bay, Labrador. At 19 he enrolled at the Culinary Institute of Canada in Charlottetown, Prince Edward Island. It was during his time at the CIC, and is years spent as an intern under Chef Jason Lynch of LeCaveau at Grand Pre Winery, that Steve’s desire to push forward with his culinary career solidified. 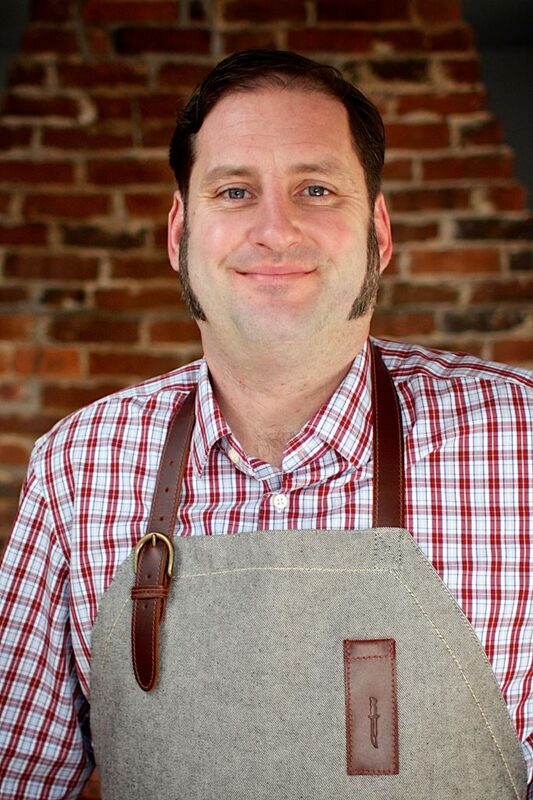 In 2006 Steve was named Executive Chef at Whalesbone Oysterhouse. 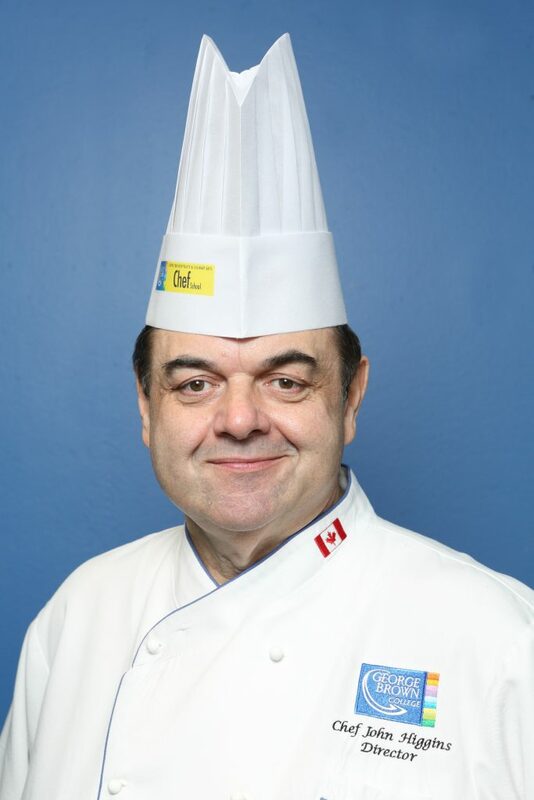 During his tenure there he was the youngest chef to compete in Gold Medal Plates. . From there Steve won the hearts of Ottawa diners at the helm of such restaurants as Town and Lux Bistro, all while traveling and cooking in some of the world’s best restaurants. (Per se, Le Bernardin, A voce, Marea) During one of his many staging trips to New York, Steve realized his true passion for pasta and made the decision to open his own restaurant with a heavy focus on fresh, extruded and hand made pastas. In 2013, Steve and his wife Jennie opened the doors to Supply and Demand Foods and Raw Bar, a 58-seat neighbourhood oyster bar specializing in fresh pasta. 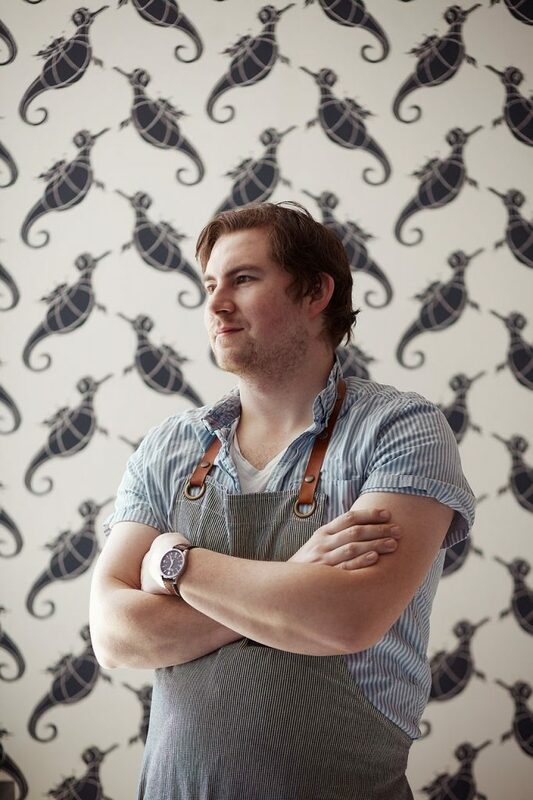 In 2014 Supply and Demand was named 4th best new restaurant in Canada by EnRoute Magazine, and Steve was named one of the top 30 under 30 for his industry achievements. Steve currently lives with Jennie and their two children just down the street from his restaurant. He continues to work the line five nights a week and teaches private pasta-making classes in the prep room. Steve also keep Ottawa pasta lovers happy selling his noodles at the local farmers market. 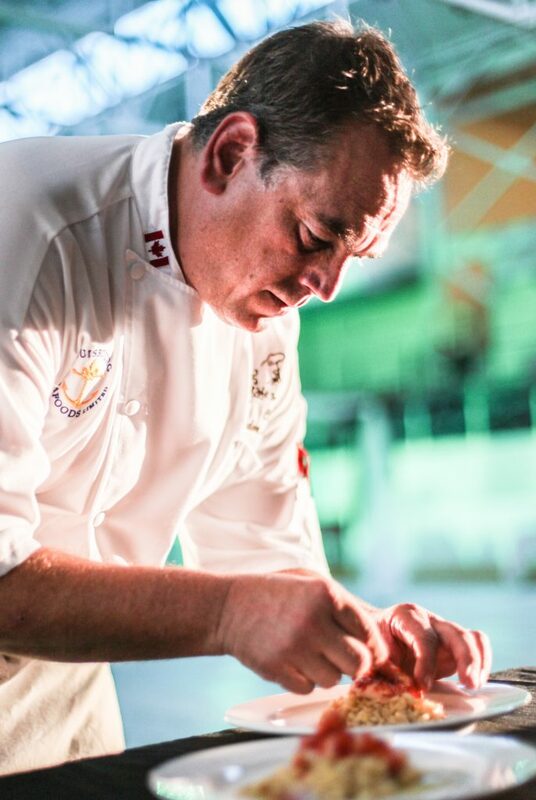 Chef Ardon Mofford is a fervent ambassador in the advancement of culinary development on Cape Breton Island. With a passion for both the region and the sector, the College alumnus mentors faculty with the Marconi Culinary Arts program and supports aspiring chefs by employing graduates and helping them in the work required for their Red Seal certification. Born in Montreal, Chef Mofford grew up in St. Peter’s, Cape Breton where, at the age of 11, he began his journey in culinary arts by assisting his father in the family-run The MacDonald’s Hotel and Dining Room. There he learned from his father and mother, Chef Ardon Sr. and Michaeleen Mofford, the finer points of quality food and service. Chef Mofford graduated with a Tourism Marketing degree from Cape Breton University and continued his Red Seal certification through NSCC Marconi Campus in 2001. He is currently executive chef and owner of two Sydney restaurants: Governor’s Pub & Eatery and the Commoner Table & Tap. He is committed to local, sustainable food and uses a love for the sea and his Celtic-Caribbean roots as inspiration for his signature cuisine. Chef Mofford is a supporter of continuous learning. Together with the Destination Cape Breton Association and the Atlantic Canada Opportunities Agency, Chef Mofford developed an advanced training program for chefs at the world-renowned International Culinary Center. Thirteen Cape Breton chefs had the opportunity to train there in 2014 and 2015, elevating Cape Breton’s culinary scene to the next level. His commitment to excellence in the field is reflected in his involvement in many culinary projects and local community initiatives, including the Right Some Good Food Festival. He has been recognized as the Tourist Magazine’s 2014 Chef of the Year, the 2014 Sydney Chamber of Commerce Service Above Self Award and the 2012 Meeting Professional International Event of the Year. In 2015, the Sydney Area Chamber of Commerce named him the Cape Breton Regional Municipality Ambassador of the Year. Bronze Medalist 2015 Gold Medal Plates competition. Investing his talent and time mentoring those following in his footsteps, Chef Mofford’s passion for the culinary industry is equal only to his love for Cape Breton, its growth and success. Martin Ruiz Salvador was born and raised in Nova Scotia. He began his culinary career as a young dishwasher in Halifax then worked his way across the country as a line cook. When he decided that cooking would be his life, Martin enrolled in the two-year Le Cordon Bleu Program at the Scottsdale Culinary Institute in Arizona. Upon graduation, he went to Europe where he apprenticed at Dublin’s Michelin-starred Commons Restaurant under Chef Aiden Byrne. With a desire to hone his skills and mastery of French cooking, Martin then moved on to the source…the culinary Mecca of Lyon…where he did back-to back stints at Michelin 2 starred Restaurant Lyon de Lyon with Chef Jean-Paul LaCombe, followed by an inspiring term at Caro de Lyon under the tutelage of renowned Chef Frédérick Côte. Upon returning to Canada, Martin decided that he wanted to open his own fine dining restaurant in rural Nova Scotia. In 2004, he and his wife Sylvie opened Fleur de Sel in Lunenburg where Martin’s menus harmoniously meld his classical French training with his own Nova Scotian roots and locale. In 2005, Fleur de Sel earned eighth spot in En Route’s Top Ten New Restaurants in Canada. Martin has since opened The Salt Shaker Deli & The South Shore Fish Shack in Lunenburg, cooked at James Beard House in New York, competed in the National Gold Medal plates competition in 2008, 2014 & 2016, represented Nova Scotia at The Canadian Chefs Congress and has held Four Diamonds with CAA since 2007. In 2015, Fleur de Sel was named #22 by MacLean’s Magazine’s Canada’s Best 100 Restaurants. In 2016 Martin & Sylvie took a year sabbatical from Fleur de Sel to make time for the arrival of their son Oscar. In August of 2016 they opened The Half Shell Oyster & Seafood, an open air dining experience built next to the Fish Shack on Montague Street. Martin is now looking forward to the relaunch of Fleur de Sel in the spring of 2017.